Read the latest news, announcements and events, such as the Tribal Land Staff National Conference, CLE opportunities, land issues, and items in the press about activities of the Indian Land Tenure Foundation and our grantees and affiliates. 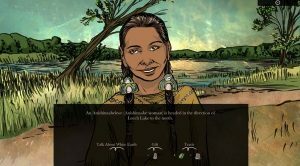 St. Paul, Minn. – The Indian Land Tenure Foundation is excited to announce the release of a new educational video game that teaches about the impact of allotment acts on Indigenous peoples in the 1890s. Available on PC/MAC, iPads, Android tablets and Chromebooks, When Rivers Were Trails is an accessible, educational 2D adventure game that will help teach young people about an important and often-overlooked period of time in United States history. When Rivers Were Trails was developed by ILTF in collaboration with Michigan State University’s Games for Entertainment and Learning Lab thanks to support from the San Manuel Band of Mission Indians. The game follows an Anishinaabeg in the 1890’s who is displaced from Fond du Lac in Minnesota to California due to the impact of allotment acts on Indigenous communities. More than 20 indigenous writers were tapped in the development of When Rivers Were Trails, bringing their valuable experience to the project. The journey can change from game to game as players randomly come across Indigenous people, animals, plants, and run-ins with Indian Agents. Gameplay speaks to sovereignty, nationhood, and being reciprocal with land. When Rivers Were Trails is available for download on PC and Mac, Apple’s AppStore and the Google Play Store. The game features creative directing by Nichlas Emmons, creative directing and design by Elizabeth LaPensée, art by Weshoyot Alvitre, and music by Supaman and Michael Charette. Indigenous writers include Weshoyot Alvitre, Li Boyd, Trevino Brings Plenty, Tyrone Cawston, Richard Crowsong, Eve Cuevas, Samuel Jaxin Enemy-Hunter, Lee Francis IV, Carl Gawboy, Elaine Gomez, Ronnie Dean Harris, Tashia Hart, Renee Holt, Sterling HolyWhiteMountain, Adrian Jawort, Kris Knigge, E. M. Knowles, Elizabeth LaPensée, Annette S. Lee, David Gene Lewis, Korii Northrup, Nokomis Paiz, Carl Petersen, Manny Redbear, Travis McKay Roberts, Sheena Louise Roetman, Sara Siestreem, Joel Southall, Jo Tallchief, Allen Turner, and William Wilson, alongside guest writers Toiya K. Finley and Cat Wendt who contribute African American and Chinese experiences. St. Paul, Minn. – Land is critical to issues facing American Indian people as they pursue economic development, financial independence, and the preservation of their culture and history. The Indian Land Tenure Foundation (ILTF) is committed to serving Native nations in the recovery and control of their rightful homelands. 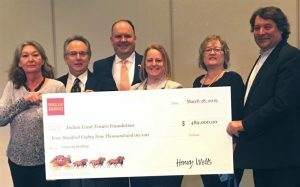 With a new $489,000 grant from the Wells Fargo Foundation, ILTF will be able to continue to help tribes improve and support the operations of their tribal land offices through its National Tribal Land Office Initiative. Through the grant funding over the next two years, the four components of ILTF’s National Tribal Land Office Initiative – the National Tribal Land Association, the annual Tribal Land Staff National Conference, the Online Tribal Land Office Professionals Certification Program, and Tribal Land Office Summer Internships – will continue to grow and facilitate ILTF’s access to that dynamic network. Wells Fargo Foundation has awarded nearly $13 million to nonprofits supporting American Indian and Alaskan Native Communities as part of a five-year, $50 million commitment to expand its focus on tribal philanthropy. The grant award recognizes ILTF as a Native non-profit serving critical needs in Indian Country, and was made to help build ILTF’s organizational capacity and expand services. ILTF is a national, community-based organization that works to promote education, increase cultural awareness, create economic opportunity, and reform the legal and administrative systems that prevent Indian people from owning and controlling reservation lands. As a community foundation, ILTF accepts contributions from foundations, tribes, corporations, organizations and individuals to support its grant making and program initiatives. Since its inception in 2002, ILTF has provided more than $45 million in grants, loans and program services in support of Indian land recovery and management. The Foundation makes a positive impact on the lives of Native Americans through a variety of innovative programs and initiatives like its National Tribal Land Office Initiative. The world’s most influential thinkers, creators, makers and doers share their insights as part of the acclaimed ‘Talks at Google’ series. Cris Stainbrook, President of Indian Land Tenure Foundation and a thought leader on the history and future of American Indian lands, took part in the series recently with his presentation, “Indian Land: The Lasting Legacy of Manifest Destiny.” Stainbrook discussed how U.S. history has shaped Indian policy and led to the fractured state of Indian land tenure today, and shared the Foundation’s vision for the future of Indian land. Talks at Google is a regular speaker series held at company offices around the world primarily for the benefit of Google’s 85,000 employees. Talks are also available on YouTube so that they are universally accessible by anyone who is interested. The series began more than 12 years ago and there have been over 4,000 talks since then. The initial presenters were employees (so-called “Googlers”) but then expanded to include authors and experts from around the world from a variety of different backgrounds. Majel M. Russell Esq., Elk River Law Office PLLP – Majel Russell was raised on the Crow Indian Reservation and is an enrolled member of the Crow Tribe. Ms. Russell graduated from the University of Montana School of Law in 1992 and is a founding partner in the law firm. She practices primarily federal Indian law representing tribes and tribal entities and litigates matters involving tribal jurisdiction, authorities, Indian businesses, school districts and civil litigation in Federal, State and Tribal Courts. Ms. Russell has also served as Principal Deputy Assistant Secretary of Indian Affairs in Washington, D.C. where she gained experience working with federal budget priorities, policies and regulations developing strategies for overcoming bureaucratic obstacles. Clark Madison, former Regional Realty Officer, DOI, BIA – Clark Madison is an enrolled member of the Assiniboine and Sioux Tribe(s) of the Fort Peck Indian Reservation and a graduate of Montana State University-Billings. Mr. Madison, now retired from the Bureau of Indian Affairs, was the Regional Realty Officer in the Rocky Mountain Region for the last 19 years of his career. Mr. Madison was a member of the national American Indian Probate Reform Act (AIPRA) team that provided training to regional BIA staff, Land Titles and Records Offices, and BIA agency staff regarding AIPRA. Mr. Madison also participated in developing regulations for Title 25 of the Code of Federal Regulations, including surface leasing, conveyances, easements and land records. Mr. Madison has vast experience dealing with trust land transactions and a unique insight into the impact AIPRA has had on regulatory procedures. Course registration fee is $800. For more information, please contact Stephanie Harris at Elk River Law Office by email (sharris@elkriverlaw.com) or telephone (406-259-8611). 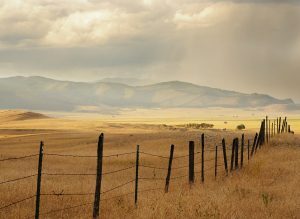 WASHINGTON – The Department of the Interior announced today that more than 2,000 landowners with fractional interests at the Confederated Tribes of the Umatilla Indian Reservation in Oregon have been sent purchase offers from the Land Buy-Back Program for Tribal Nations. 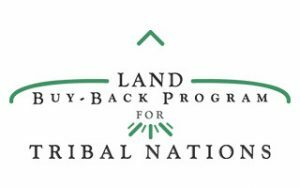 The Buy-Back Program implements the land consolidation component of the Cobell Settlement, which provided $1.9 billion to consolidate fractional interests in trust or restricted land within a 10-year period set to expire in November 2022. As a result of the Buy-Back Program, tribal ownership now exceeds 50 percent in more than 27,000 tracts of land (representing an increase of approximately 120 percent for the locations where implementation has occurred), strengthening tribal sovereignty and self-determination. Since the Program began making offers in December 2013, more than 762,000 fractional interests and the equivalent of nearly 2.2 million acres of land has been transferred to tribal governments. To date, the Program has made nearly 240,000 offers to Indian landowners. Landowners with fractional interests at the Umatilla Indian Reservation have until August 14, 2018, to consider and return accepted offers in the pre-paid postage envelopes provided. Landowners also can contact the Trust Beneficiary Call Center at 888-678-6836 or visit their local Office of the Special Trustee for American Indians to ask questions about their land or purchase offers, request a copy of the appraisal completed for their land, and learn about financial planning. ST. PAUL, MINN. – More than 10,000 California students will learn about Native American land, history and culture over the next three years thanks to the partnership of San Manuel Band of Mission Indians in Highland, Calif. near San Bernardino, and the Indian Land Tenure Foundation (ILTF) in St. Paul, Minn. The Tribe has made a $471,062 grant to ILTF to expand the use of its Lessons of Our Land curriculum to 300 more California schools. The grant will enable ILTF, in collaboration with local school districts, to provide on-site training to more than 350 California teachers, as well as develop a new website and mobile application that offers easier access to lessons, and ongoing professional development for educators. The Indian Land Tenure Foundation (ILTF) is a national, community-based organization serving American Indian nations and their citizens in the recovery and control of their rightful homelands. ILTF works to promote education, increase cultural awareness, create economic opportunity, and reform the legal and administrative systems that prevent Indian people from owning and controlling reservation lands. Lessons of Our Land is an interdisciplinary curriculum developed by ILTF that enables Pre-K through grade 12 teachers to easily incorporate Native American stories, lessons and games about land, cultures, histories and languages into regular classroom instruction while meeting state and federal educational standards. The new Lessons of Our Land website was recently launched. Teacher training will begin later this year. 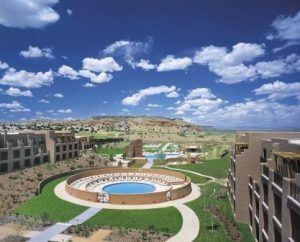 The San Manuel Tribe is committed to education and has a long history of supporting projects that share the history, culture and knowledge of Native communities. The Tribe is pleased to partner with ILTF to help more California students learn these important lessons. More information on the curriculum is available at lessonsofourland.org. The Indian Land Tenure Foundation (ILTF) is a national, community-based organization that works with American Indian tribes and organizations that support Native nations and people in the recovery of their rightful homelands. Thanks to a $200,000 Ecosystem grant from the Bush Foundation, ILTF will be able to financially support several American Indian start-up organizations that are helping to return Indian lands to Indian hands. 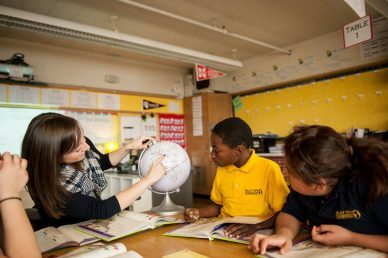 The Bush Foundation provides Ecosystem grants to help sustain organizations such as ILTF that create unique and significant value by providing critical data and analysis, spreading great ideas and building capacity, advancing public awareness and policy, and building and supporting leadership networks. Established in 1953 by 3M executive Archibald Bush and his wife Edyth, the Foundation invests in great ideas and the people who power them. Inspired by the Bushes’ desire to build their community and encourage innovation, the Foundation has invested nearly one billion dollars in grants to thousands of organizations and individuals. Estate Planning – Providing education and estate planning services for tribal members as a way to stop the continued division of Indian land titles, and to ensure that Indian lands are controlled and managed by Indian people. Land has never been more important for American Indian people as they pursue economic development, financial independence, and the preservation of their culture and history, and the Indian Land Tenure Foundation (ILTF) is committed to serving Native nations and their citizens in the recovery and control of their rightful homelands. Thanks to a $1.5 million operating grant from the NoVo Foundation, ILTF will be able to continue its innovative programs and initiatives that are helping return Indian lands to Indian hands. 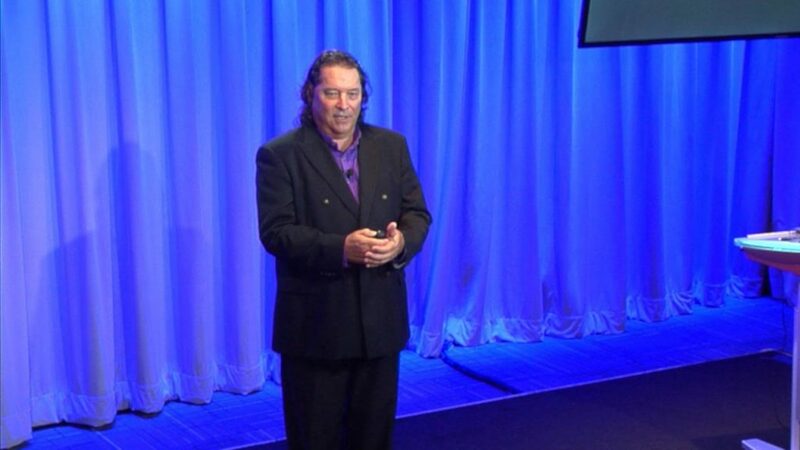 The NoVo Foundation is dedicated to building a more just and balanced world. Founded in 2006 by Jennifer and Peter Buffett, NoVo has become one of the largest private foundations in the world to support Indigenous communities and organizations in North America as they determine their own priorities for the future. 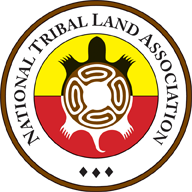 National Tribal Land Association (NTLA) – Professional association for tribal land and natural resources staff to learn, share and network with their colleagues from other tribes. The Tanka Fund – National campaign to bring renewed health and opportunity to American Indian communities through buffalo restoration, promoting healthy lands, healthy people and healthy economies. Spirit of Sovereignty – A National Indian Gaming Association-advised fund at ILTF that makes the opportunity for higher education a reality for Native American students by providing scholarships to attend tribal college. Lessons of Our Land – Pre-K through grade 12 curriculum that enables teachers to easily incorporate Native American stories, lessons and games about land, cultures, histories and languages into regular classroom instruction. 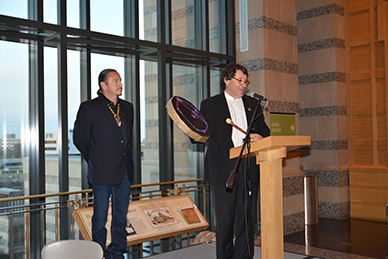 In a special ceremony held at the Minnesota History Center in St. Paul, the Indian Land Tenure Foundation was pleased to honor the Lakota, Dakota and Nakota tribes whose efforts resulted in saving and protecting the Pe’ Sla sacred site located in the Black Hills of South Dakota. Watch a slideshow of the celebration. Learn more about Pe’ Sla. Developed by the Bureau of Indian Affairs (BIA) as an interactive reference tool for its employees, the Tribal Leaders Directory map is now widely used by government, news media, business, researchers, and the public as a resource to help guide communication in Indian Country. On Tuesday, Sept. 15, 2015, the U.S. Department of Agriculture announced the Indian Land Tenure Foundation as one of its 2015 Conservation Innovation Grant award recipients. 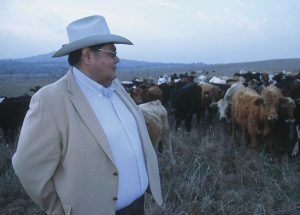 The grant will utilize its National Indian Carbon Coalition (NICC) program to develop environmental markets in Indian Country involving rangeland management and several different Native nations. Learn more about the project on the NICC website at indiancarbon.org. Indian Land Tenure Foundation will be offering more free landowner training in August. We are hosting several upcoming free training sessions for Native American landowners and agricultural producers in South Dakota, Nebraska and Wisconsin. The training is free to anyone who would like to attend and includes lunch and refreshments. For more information, please contact Jim Wabindato (jwabindato@iltf.org or 651-766-8999) at ILTF. The 7th Tribal Land Staff National Conference was held at the Hyatt Regency Tamaya Resort and Spa, Santa Ana Pueblo, New Mexico March 21-23, 2017. It was a record-breaking year with 344 attendees, representing 91 federally recognized tribes. Participants were able to learn, share and network with other tribal land staff professionals during conference sessions, and networking breaks. This year’s theme focused on advancing sovereignty and self-determination through tribal land management. Attendees had the opportunity to choose from numerous sessions, including topics focusing on Land and Reality Offices, Cultural and Environmental, and Advancing Sovereignty and Self-Determination. Materials from the conference are available to tribal land professionals on the Indian Land Forum Website. The 8th Tribal Land Staff National Conference will be held in 2018 in Tulsa, Okla. Learn more about this event at ntla.info/events. The Indian Land Tenure Foundation announces a Continuing Legal Education (CLE) course on the Black Hills settlement. This two-hour session will be hosted at the Comfort Suites Hotel and Convention Center in Rapid City, South Dakota on Friday, July 22, 2016. The session starts with coffee and light refreshments at 9:00 a.m., program at 10:00 a.m., and will conclude at noon. The course will cover the Black Hills Claim (Docket 148-78) and the 1851 Treaty Title Claim (Docket 74). For attorneys seeking credit for this course, a registration fee of $200 is required. For the non-legal public interested in learning more about the settlement, we request a nominal contribution of $30 to help cover costs of offering the course. Current law students and the Governor of South Dakota may register for the program free-of-charge. The Sealaska Corporation is a for-profit company collectively owned by some 23,000 Native Alaskans from the Haida, Tlingit, and Tsimshian tribes. Since its creation in the 1970s, the company has made much of its money by logging in Alaska’s southeast islands. But beginning this year, that equation will flip: Sealaska stands to earn millions by leaving trees alone. In March, Sealaska received approval to participate in California’s cap-and-trade marketplace. That means the corporation will preserve 165,000 acres—45 percent of the forestland it controls—for 110 years to serve as a carbon sequestration bank. In return, Sealaska can sell carbon-offset credits to California companies that must curb their emissions under state law. 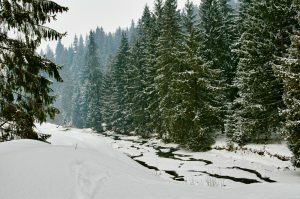 This system, so far, has been kept to privately owned forests. But the idea of leasing publicly owned land for carbon banks is gaining attention from researchers. Under the current system, forestland leaseholders turn a profit by cutting and selling trees. But what if companies could bid on leases with the idea of conserving the land as a carbon bank? It might actually be more profitable than doing so on private land, because federal leases present a relatively low-cost option on a massive scale. There is plenty of potential for national forests to act as a carbon sink, and according to the U.S. Forest Service, America’s public forests already offset 16 percent of our annual carbon emissions. Read the article at indiancountrytodaymedianetwork.com. 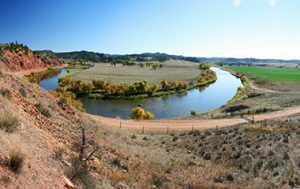 The Bureau of Indian Affairs placed a sacred site in the Black Hills of South Dakota in trust.The Crow Creek Sioux Tribe, the Rosebud Sioux Tribe, the Shakopee Mdewakanton Sioux Community and the Standing Rock Sioux Tribe raised $9 million to purchase Pe’ Sla, a 2,022-acre site that plays a central role in Lakota history, culture and cosmology. The tribes celebrated after learning of the BIA’s March 10 decision. A representative from the Indian Land Tenure Foundation publicly recognized Columbia Heights Public Schools for its work in incorporating the Lessons of Our Land curriculum across the school district. The curriculum incorporates Native American Stories and lessons into regular classroom instruction. Nichlas Emmons, program and development officer for the Indian Land Tenure Foundation, spoke to the School Board during its Oct. 13 meeting as part of a presentation with teaching and learning leaders on the curriculum integration, and also to recognize the district for its efforts. Assisting efforts by the Lakota, Dakota and Nakota people to purchase and protect more than 2,300 acres at the Pe’ Sla sacred site in South Dakota. Helping create the National Tribal Land Association (NTLA) to bring together land professionals from Native Nations who are working to preserve, protect, develop and manage Indian land. Establishing the National Indian Carbon Coalition (NICC) to help Native Nations enter the emerging carbon credit markets, earning valuable income while protecting precious natural resources. Creating strategic land planning and educational tools used by tribal land planners and real estate professionals. Watch for new success stories as these are added. 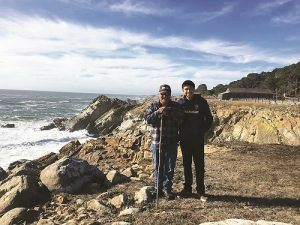 Nearly 150 years after being forcibly removed from their ancestral homelands to an inland reservation, the Kashia Band of Pomo Indians in Sonoma County, Calif., once again have access to the Pacific Ocean. On June 15, 2016, the Tribe celebrated the recovery of nearly 700 acres, a milestone made possible with the help of the Indian Land Tenure Foundation (ILTF) and its affiliate, the Indian Land Capital Company (ILCC). ILCC extended a loan to Kashia in 2015 to purchase the land north of San Francisco, which features redwood forest, towering coastal bluffs and spectacular waterfalls. The Tribe has established the Kashia Coastal Reserve, a protected open space and demonstration forest to educate and engage the public about the history and practices of the Kashia people. Learn more about success stories made possible with financing from Indian Land Capital Company at ilcc.net. The 6th Tribal Land Staff National Conference was held at the Coeur d’Alene Casino Resort Hotel in Worley, Idaho March 22 – 24, 2016. As we traveled to the Northwest this year, tribal land staff from tribes who have not participated in the past were able to attend and experience a great opportunity to learn, share, and network with other tribal land professionals throughout Indian Country. A total of 68 tribes were represented with over 250 attendees. Participants had the opportunity to choose from 21 unique sessions including topics such as: Title Defects and Remedies, Tribal Airspace Rights, Contemporary Land Trusts, Fee-to-Trust Tribal Acquisitions to Federal Conveyance, Land or Real Property Codes, and Sustainable forestland managements. Materials from the conference are available to tribal land professionals on the Indian Land Forum website. Learn more about the 2017 Tribal Land Staff National Conference at ntla.info. In 2008, Indian Land Tenure Foundation (ILTF) funded the adaptation of ILTF’s K-12 curriculum, Lessons of Our Land, to reflect Montana tribal histories and cultures and to implement the curriculum in classrooms state-wide. Montana public schools educate nearly 150,000 students each year, with Indian students making up about 12 percent of the student population. Montana has been on the front line of an emerging trend in state legislatures’ and education departments’ mandatory inclusion of tribal histories and cultural components into classroom materials. In 1999, the Montana Legislature passed the Indian Education for All Act, requiring all public schools throughout the state to include coursework in the history and culture of Indian tribes in the state. Teachers in Montana now have a wealth of resources to incorporate Native American perspectives in classroom materials. The newly adapted curriculum was developed through extensive research and interviews with tribal elders and historians from Montana’s 12 tribes who reside on seven reservations throughout the state. The resulting product is a rich and varied source of lesson plans and materials, including photographs, slideshows, maps and a Montana tribal lands jeopardy game. All of the lessons align with Montana’s state-wide content standards. ILTF hopes that the curriculum adaptation and implementation in Montana will serve as a catalyst for other states, especially those with significant Indian populations. In 2007, South Dakota, where nine percent of the total population and more than 11 percent of public school students are Native American, passed an Indian Education Act to support existing statewide Indian education programs and provide teacher training. Despite this progress, the state has yet to pass a mandate similar to Montana’s. To help them move in that direction, in 2008, ILTF made a grant to South Dakota’s Office of Indian Education to support the development of state academic standards in American Indian history and culture for the state’s K-12 programs. The Head Start and K-12 curriculum is free and available to all at lessonsofourland.org.